I never had a dog in college, but my friends did and I think they made just about every common puppy training mistake in the book. Of course I didn’t know any better at the time because as a kid anything I learned about dog training was from word of mouth. We always had a family dog, but we never took him to a puppy kindergarten or a basic dog obedience training class. When I picked up Linus nearly 8 years ago I was determined that I would have a well-behaved dog. That’s why I started reading puppy training books well before picking up my first puppy. I’ve mentioned this before and I’ll say it again if you’re getting a puppy and there is one book you’d like to read I highly recommend picking up and reading Puppies For Dummies. I’ve read it several times and own all 3 editions. Dublin loves sleeping in his crate! Today I wanted to discuss 10 common puppy training mistakes that I’m sure we’ve all made during our years of puppy raising. In fact many of these mistakes I never even knew about until I started studying the art of dog training! Why is this a big mistake? You really don’t want to associate anything negative with your pup’s name. Anytime your puppy hears his name he should come bolting to you. However, if you’re always associating the negative command “No” along with your puppy’s name he will become hesitant when he hears his name and he will be confused. In the past people thought that puppies didn’t start learning until they were 6 months to a year old. Why is it important to start training from day 1? Your puppy is learning new things the day he comes home. So it’s a good idea to start teaching him good behaviors rather than letting him pick up bad ones on his own. I have nothing against you if you do this because after 8 years of working with my puppies and other people’s puppies I still repeat commands. It’s very difficult to overcome. Why is it not good to repeat commands? Because your puppy may start to think that “sit, sit, sit, sit, sit” means “sit”. In other words you may accidentally train your puppy to respond to actually put his bottom to the ground after you say the 5th “sit”. When I was in college my roomate used to do this with his puppy and guess what? There were land minds all over the house and the puppy never learned that he was not supposed to potty in the house. His pup never understood house training and my roomate never understood how to potty train a puppy. Why is it not a good idea to scold your pup after he has an accident in the house? Dogs live in the moment. Unless you catch him in the act he has no idea that you are scolding him for the accident he made 5 minutes ago. He more likely thinks you’re getting mad at him for whatever he is doing at the moment. I’ve mentioned this before, but here’s what you should do if you find your puppy had an accident in the house: My Favorite Puppy Training Tip. I hear it all the time…why do you put your puppy in a cage? That’s so cruel! It’s actually not cruel and with a bit of training your puppy will learn to love his crate. Crate training is a great way to house train your puppy and also it will keep your puppy out of trouble (chewing, digging, raiding trash cans, and soiling floors). QUICK RECOMMENDATION: If you decide you would like to crate train your puppy we highly recommend the MidWest Life Stages Double Door Crate. We got one for Linus and still use it 10+ years later. Why is a crate not cruel? Dogs are den animals who feel comfortable when they are sleeping in a covered area. Dogs feel calm in the security of a den. Linus my first puppy automatically goes into his crate because he feels comfortable there. He also used to find other den like areas when the crate wasn’t available like our guest bathroom and the closet. You may have noticed that many dogs will choose to sleep in places in the house that resemble a den like under a table, a desk, or alcove. I always noticed my puppies used to squeeze into tight corners which was probably another instinct to find a den like place to sleep. There’s a discussion going on in the comment section saying that some dog trainers no longer consider this true (or may have never thought it was true)…check out the discussion and let us know your thoughts. It’s in our nature to reassure our children when they are scared, so why would it be any different when your puppy is scared? Why shouldn’t you reassure a a scared puppy? You don’t want to coddle your puppy when he is afraid of something that cannot harm him. A good example would be thunder. QUICK TIP: If you’re puppy is having some anxiety problems we’ve had some moderate success with the Thundershirt (Raven and Linus both have their own Thundershirt). While it doesn’t work with every dog we have heard that it’s absolutely life saving for others. Do not pet and reassure your puppy in these situations otherwise he’ll there is something to be fearful of and repeat the behavior the next time he experiences the same scary situation. Instead of rewarding fearful behavior try giving your puppy a command and rewarding him for that behavior. This will help get your puppy’s mind off the scary situation. 6 common puppy training mistakes that I’m sure we’ve all made.! 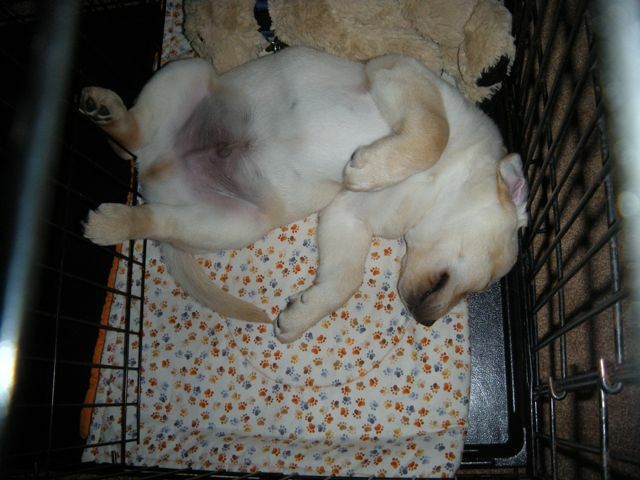 Way back before I brought home my first puppy, Linus I probably would have made all 6 of these mistakes (and more). Do you have any other common puppy training mistakes you’d like to add to the list? QUICK RECOMMENDATION: Before brining home our first puppy we made sure to read and absorb as much information about raising and training puppies. One of the best books we picked up was Puppies for Dummies. This book helped set a great foundation for us before we brought home our little buddy, Linus. I’m glad you find some of our information useful. I’m constantly reading about new ways to train my pups and post most of the information here on the blog. If you have any questions please feel free to ask and I’ll do my best to answer. Pampering: It’s extremely difficult to not want to pamper and spoil your adorable little fur ball. This however, is another most common puppy house training mistake that people make; especially, when it comes to food. If your puppy refuses to eat what’s put on his plate, don’t keep offering him treats until he shows an interest in something. Dogs will not starve themselves. Sooner or later, your puppy will eat what’s given to him whether or not he thinks it tastes like pepper steak. Giving him what he wants at the puppy stage will ensure you have a full-fledged spoilled brat of a canine companion with seriously expensive dog-food bills to boot. Yes, and it’s tough not to pamper a cute adorable puppy. I notice this a lot with the toy breeds. Sorry for the late response. We had some troubles when we were crate training Stetson. Here’s an article we wrote on crate training puppies that might help you out: https://puppyintraining.com/crate-training-puppies/. I had to convince my husband to crate train our dogs when we first got them. He thought it was cruel. Instead he wanted to leave them in the back yard all the time. We live in Florida and it gets very hot. I won and our dogs are crate trained and they love their crates. This also give us a place to keep them when it’s too hot or rainy outside. They are indoor/outdoor dogs and after 7 years I can’t imagine life without them. My boyfriend and I picked up our puppy Piper almost a month ago, and the crate has been a godsend. We messed up at first, since she cried all night the first night we took her out and let her sleep where she wanted (she chose the hardwood floor, dogs are weird!). After about a week of that, however, she chewed our drywall while we slept and we realized the crate was necessary. After a few nights of crying (her) and frustration (us) she now sleeps through the night. She’s a Great Pyrenees mix, so she’s big for 12 weeks, which is great because she can now hold her bladder all night and doesn’t wake us up for pee breaks. She’s also mastered sitting and lying down on command, though we’re still working on the “off” command (she keeps jumping up against the counters and table.) Shes also part Catahoula so she’s very vocal and has recently started howling if we crate her while she’s really worked up. Anyway, short version is that I’ve totally made these mistakes but correcting them has been very worth it. These are great tips. We are currently owner training (with the help of a trainer) our puppy to be a service dog for my daughter. I do have a question though, and I do not seem to be able to find the answer anywhere. When you catch your puppy in the act of peeing in the house what are you supposed to do? I know you dont scowled when you find the mess afterwards, but when you actually catch them doing it, besides a quick/sharp ‘yelp’ to get their attention, what else is there?